Clara Barton's Andersonville testimony about the atrocities of prisoner of war camps in the Civil War was specific, detailed and hair-raising. It also was an unusual public speaking role for a woman at a time when women in the U.S. generally stayed away from making speeches--but her topic was so compelling, this testimony led to a speaking tour. Ida B. Wells's 1909 "This Awful Slaughter" details a different set of atrocities, the lynching deaths of black men in the American south, mob killings outside the rule of law. She tied them firmly to women, who were used as the excuse for the killings. 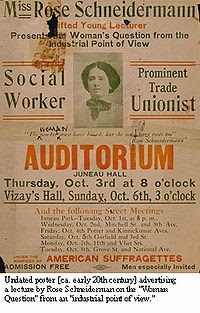 Rose Schneiderman's speech on the Triangle Fire was itself fiery, so impassioned that it inspired a woman who became the first female Secretary of Labor in the U.S. This trade union activist didn't eulogize the dead workers so much as she castigated the audience for ignoring their plight until it was too late. Emmeline Pankhurst's "Freedom or Death" laid out the stakes, as she saw it, in the fight for women's votes in Britain. That wasn't just a rhetorical flourish: The British fight for suffrage got violent early and often. She made this historic speech in the U.S. while raising funds and avoiding yet another jail term. The Elizabeth Glaser and Mary Fisher convention speeches on AIDS were delivered for dueling political parties, but contained more shared than disparate themes. They shared lessons from those who died of AIDS and from their own efforts to live with the disease. Princess Diana and the ban on landmines highlighted those who are inadvertent casualties of war weapons left behind on the field. This speech was delivered not long before her own death. Maya Angelou's eulogy for Coretta Scott King is warm, loving, frank and funny, as it should be from one longtime friend to another. You'll get a different and more intimate view of the civil rights icon in this speech from an expert and up-close observer. Jennifer Granholm's 2005 tribute to Rosa Parks was a state governor's official tribute to a daughter of Detroit. But it mixes Granholm's great oratory with insights about an activist who was herself a great speaker. Caroline Kennedy's eulogy for Edward Kennedy notes how he used to push her into public speaking roles, despite her discomfort--and pushes past that feeling to share a quiet and loving view of the late senator. Edwidge Danticat's testimony on death in detention put the novelist before a congressional committee to describe what happened to her uncle when he emigrated from Haiti but died during detention when his regular medications were taken from him. It's dramatic, tense and taut, another witness to an avoidable death. Marie Colvin's eulogy for fallen war correspondents has an eerie quality when it's read today, as she herself was killed just before she was to return from Syria after another long stint covering a war zone. This speech took place in London, in a Fleet Street church. Hillary Clinton's 2012 statement on the 9/11 killings of Americans in Libya is a formal and quiet statement. The death of the American diplomats in this attack later became a political hot-button issue for Clinton, but this statement expresses the shock of the U.S. diplomatic corps and the loss of their colleagues. Francine Wheeler's radio address on gun control reform gave the microphone and cameras usually trained on President Obama to the mother of a child killed in the Newtown, Connecticut, shootings last December, as gun control legislation--later scuttled--was under consideration.